Columbia’s Judaica collection has always been one of the most important in the country. One of the founders of King's College in 1754 was Samuel Johnson, noted scholar and Hebraist, and his collection, which he donated to the new College, included Hebrew books. Johnson himself taught Hebrew language, as did other professors throughout the eighteenth century. As early as 1859, Columbia’s collection was listed as third (behind Union Theological Seminary and Brown University) in the country for Hebraica, with 100 volumes. The UTS collection, which is now part of the Columbia collection, was first on the list, with 250. The Columbia Judaica collection became truly significant, however, through the generous donation of Temple Emanuel, the oldest Reform congregation in New York City. In 1872, Temple Emanuel purchased 2500 rare books and 45 manuscripts from a rare book dealer in Amsterdam, Fredrich Mueller. 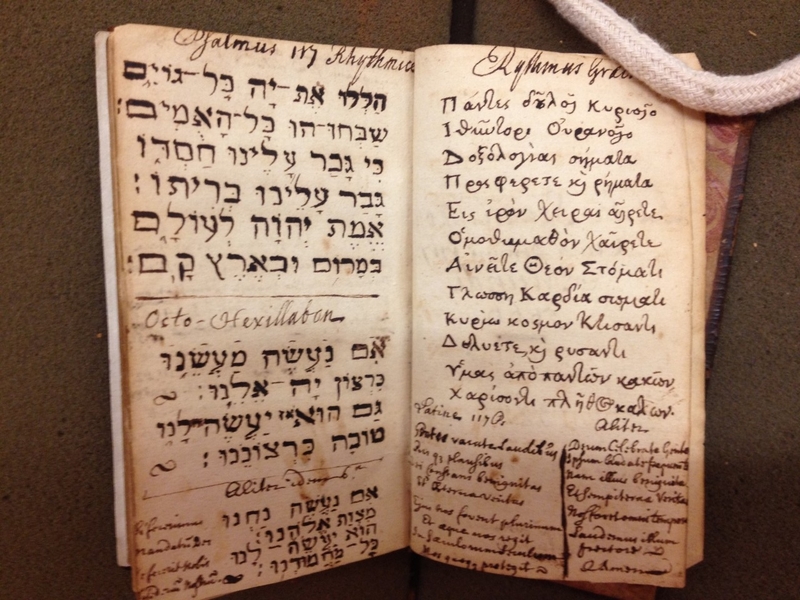 This collection was made up of the libraries of very important scholars, including Rabbi Yaakov Emden of Altona (1698-1776), the famous Talmudist and Kabbalist, and Guiseppe Almanzi of Padua (1801 – 1860), a bibliophile and poet. The Almzanzi library was significant, as Guiseppe’s father had purchased the library of Hayyim Joseph David Azulai (HIDA, 1724 - 1806), an important rabbi and scholar who traveled the world collecting and researching Hebrew rare books and manuscripts. The Almanzi collection was used by the great scholar and bibliographer Morris Steinschneider and Leopold Zunz. Temple Emanuel purchased this important collection and held it until 1892, when the Rabbi, Gustav Gottheil, convinced the temple board to donate the library to Columbia. 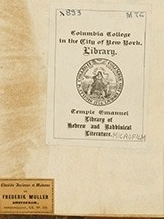 According to temple documents, the gift was as a token of appreciation for the free tuition which Columbia had begun offering to a number of Jewish students from the newly established Jewish Theological Seminary. It is interesting to note Rabbi Gustav Gottheil’s son, Richard, was the Professor of Rabbinical Literature and the Semitic Languages at Columbia, a position endowed around the same time by Temple Emanuel. Richard Gottheil bought many manuscripts for the university, and by the end of the 1890s, more than 200 Hebrew manuscripts were added to the original Temple Emanuel collection. In 1896, after a donation of manuscripts from one “L. Stern,” the New York Times claimed that the Columbia Judaica collection was “the largest in the country.” In 1900, the famed Reform leader Stephen Wise, a Columbia alumnus, donated a collection of 600-700 printed volumes from the collection of his father, Aaron Wise, to the university. In 1906, Gottheil went to France, where he purchased dozens of manuscripts related to southern French Jewry, including 32 mahzorim and thousands of communal and private documents. Professor Gottheil’s widow donated his personal library to Columbia in 1939 after his death. This consisted of 10,000 volumes, about one third of which were in Hebrew. The next phase in the development of Columbia’s Judaica collection began when Salo Baron, the famous Jewish historian, joined the Columbia faculty in 1930. Using the funds donated by the Nathan J. Miller family (the same family who endowed his chair in Jewish History), Baron was able to purchase many rare books and manuscripts for the library. In 1947, the Libraries received a gift of 3,933 volumes by and about Baruch Spinoza. The Spinoza collection was formed by a combination of the Spinoza collections of Adolph S. Oko and Carl Gebhardt, and contains material by and about the famous Jewish philosopher. It was purchased and presented to the University by Dr. Simon L. Millner, Mrs. T.W. Lamont, Corliss Lamont, and Mr. E.A. Zabriskie. In addition to its extensive and important rare book and manuscript collections, RBML also owns the archival papers to some important figures related to Jewish Studies. These include New York senator and governor Herbert H. Lehman; first US ambassador to Israel, James Grover McDonald; World War II activist Varian Fry, New York senator Bella Abzug, Yiddish translator Mirra Ginzburg, and, most recently, Columbia historian Yosef Hayyim Yerushalmi. The Bakhmeteff Archive of Russian & East European Culture also includes a number of collections relating to Russian-Jewish émigrés. Over the course of RBML’s existence, many generous donors have come forward to donate individual pieces to the Judaica collection. 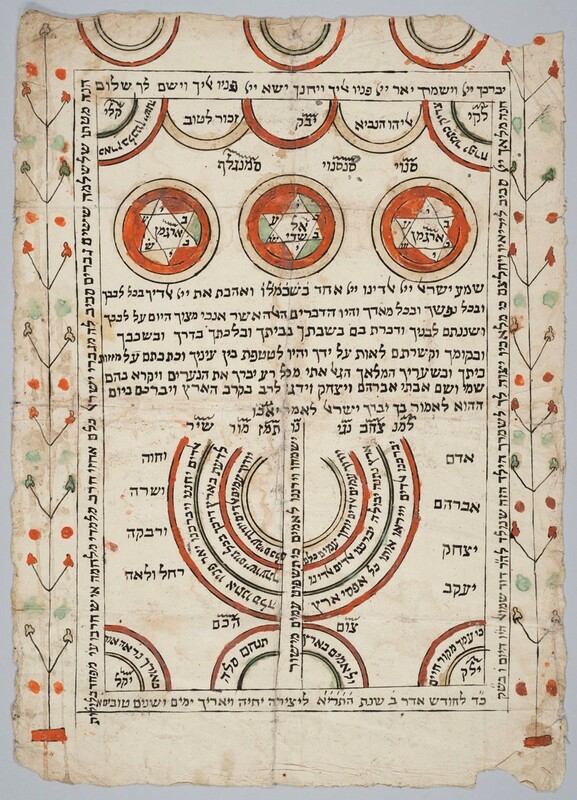 In 2008, the Norman E. Alexander foundation donated an incredible four million dollars to support Judaica collections, both rare and general, as well as a librarian to serve these collections and its users. A 2012 exhibition of the Hebrew manuscripts was called The People in the Book: Stories from Columbia’s Hebraica and Judaica Manuscripts.